Feb 2018 Update: Revv seem to have stopped Q3 in Bengalaru and also minimum booking duration in increased to 10 hours. You can now book Q3 and GLA for 4 hours for under 1000 rupees from Zoomcar (20 km usage limit, speed governor applied to limit speed at 80 kmph). Check this list for other supercars you can rent and drive. I have driven the Mercedes (A Class, C Class, E Class, GLA, CLA and few more at Mercedes Benz Luxe drive) and BMW (320d * X3) already but the Audi was pending. Both Myles and Zoom had only BMW and Merc in their fleet but hadn’t bothered adding Audi (I have a suspicion that Merc has flexed its muscle discouraging these agencies from adding competition brand- don’t know for sure). Anyways, a friend had told me about this new agency in town- Revv cars but I had kept that message in cold storage. Last weekend, I had to reach Jungle Lodges Bannerghatta Nature Park by 12 Noon. I was thinking what to do from 5 AM till 12 noon. Suddenly this rental agency came to my mind-found that they had Audi Q3 and A3 in Bengaluru and it took me no time to book one. Spoke to Revv helpline- they do operate in Bengaluru but at select locations only. They do not seem to have a fixed garage/pickup point like Myles/Zoomcar but will deliver to your address if it is within few kms from localities they operate from. Even website doesn't list what cities, locations they operate- one should do trial and error and find out (or call customer care)- so it is very annoying experience when site shows no service for specified location. I booked through their app, minimum duration was 4 hours and rental came to Rs 1300. Fuel extra. Deposit is Rs 5000. I selected HSR layout as location asked them to deliver at Silkboard which they promptly did. Their customer care was quick to connect and pretty helpful. Hopefully they will maintain same service level while they grow. Saturday morning I collected the car on time- it wasn’t cleaned very well on the outside and had minor scratches from previous rentals. The handover process was very simple and lasted just a few mins. I got into my seat and roared off. What I had got was mid range Audi (3.5 TDI)- neither the cheaper 3.0 non-quattro TDI, nor the top of line variant. This one had a massive sunroof which was cool- other premium cars I had rented were base variants without sunroof, so had some fun clicking around the sunroof. Quattro’s raw power was very inviting. Change to Dymanic mode and shift to S mode, Q3 roars ahead with all its might. But then, Revv has a speed limit of 125 kmph (Myles take note) so we couldn’t enjoy full potential of the mini SUV from Audi. Acceleration is awesome and the shrill of the engine seeps into cabin only to excite the driver in you better. Q3 is only starting range in Audi SUV and is a soft off-roader, but it sells in large numbers- For the serious souls, there is Q5 and Q7. The 3.5 TDI Quattro version I drove didn’t have navigation and rear camera- I guess Audi took them apart to sell as optional extras that the rental agency didn’t bother buying. So had to rely on sensors while reversing. Electronic seat movement is fine, but I prefer the instant response of manual adjustment (When you buy one, you can use memory seat function to pre-set your preferred position). Steering gets tilt and telescopic adjustment. Cruise control worked brilliantly well on NICE road and I fell in love with the way car responds. The looks: What I drove was a 2015 face-lift variant, which gets slightly better looking front facia and new design alloy wheels. I wasn't really sure if Revv self drive car rental will have old or new one- was happy it was the later. A proper SUV should have footrest and roof rails, which are missing here. No fog lamps in any variant. No push button start either. Parking brake is very convenient to operate. Comfort Mode: While negotiating bad roads, changed to Comfort mode to check if it absorbs all the road bumps- it does partially but not super pleased with the outcome- some of the impact is still passed on as is to occupants as if we are driving a Sumo. I think Rangerovers do a great job in this department. AC: Cooling took some time. I feel Mercedes has much more powerful AC in its class as it can chill the cabin much faster- this could be probably because we kept opening and closing sun roof once a while, resulting in need for more cooling effort. Spare tyre- check. BMW doesn't provide spare tyre, as it comes with run flat tyres that can supposedly run for 200kms even if flat. Will it really run 200kms on bad Indian roads is not verified. So Indian customers will feel more comfortable with a spare wheel in the back, so I have noticed that Zoomcar was buying an extra wheel and keeping it in the boot. Thankfully Audi comes with a spare wheel by default. 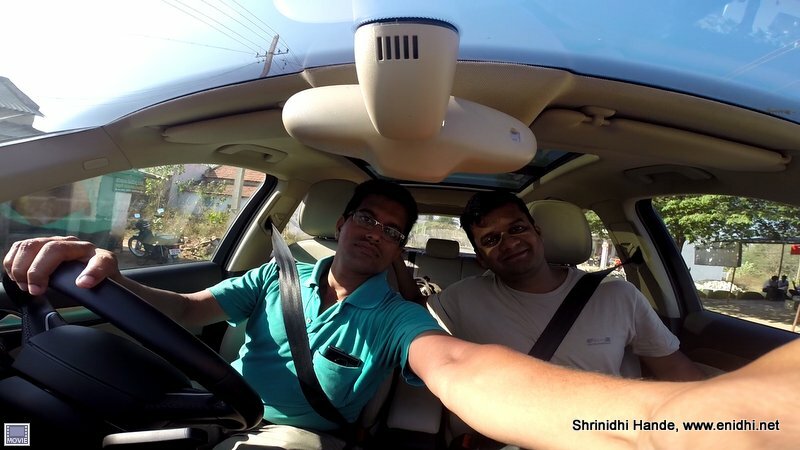 No Navigation and camera- the 40 lakh SUV misses out on Reverse Camera and Navigation. I think Audi is selling them as optional extras to keep base price low and the rental agency Revv hasn't bothered to spend on them. I had to make do with parking sensors. The Analog fuel gauge indicator is not very accurate over short volumes. Q3 has a massive 69 litre fuel tank capacity, I guess anything above 63-65 litre will be shown as full tank only. Though I was promised full tank (to the brim), full tank minus 4 to5 litre will also be shown as full tank in the display. Over a long distance this difference doesn’t impact much, but for short distance like 100 kms, though I had to fill 20 litres to fill the tank, in reality, it might have only consumed 15 litre- I won’t know for sure. I wasn’t driving in the most economic manner, as I wanted to indulge in the Audi Quattro driving experience. So if you drive very carefully, you might get few more kms per litre- but those who can afford to buy an Audi may not really care for those few extra kms. I checked with my friend who owns Audi Q3- he quoted a number of 10 kmpl in city and 13 on highway. I am yet to check if his is 3.0 TDI or 3.5 TDI with Quattro. Audi Q3’s certified fuel economy is 15.7kmpl. So I suggest not to go with numbers I got during my short drive, cross check with other sources. Q3 is one of the models affected by Volkswagen Emission scandal last year. Not sure if this vehicle also had a defeat device- Indian authorities never pursued this matter seriously. Audi Q3 is priced between 29 lakh and 38 lakhs ex-showroom. Add another 25% for on road price in your city. Audi Q3 competes with BMW X1 and Mercedes GLA. I haven’t driven the X1, but have driven the GLA, which feels a lot under-powered and short of space compared to Audi. I think Audi makes a better choice of the two (Among GLA and Q3) for sure and probably among all 3 (X1 included) as well. Hi Shrinidhi I noticed that you keep complaining about electric seats I don't know if you already know this but the key fobs can be programmed to remember a certain setting. Meaning to say if u have two drivers u can program 2 keys to 2 different settings, if u use one key to open the seats adjust to setting for that particular key and changes with the second key as soon as you open the car. So the required setting is ready even before u enter the car. Yes, I am aware of that, but that works well when you own the car... During short term rental it is easier to use the levers to adjust. Anyway, will update this note in the post. Cool experience good luck for you to drive ferrari soon. It seems I really missed a lot of fun ! About the car: I thought the Rear cam and stuff came standard. Audi seems to be playing over-smart here! @Rajiv- yes, you should have joined. With AudiQ3 3.5 Quattro gave 425km for 32 litre of Diesel it is little more than 13km.